One of the first results posted was a Temperature Map of the nucleus. From that map, it was inferred that there wasn't any free ice on the surface because the overall surface temperature was too warm. The problem with that is that the map of the entire visible face was at a low resolution 160m/pixel and a later map of just a portion of the comet was at 120m/pixel. Basically, the map was showing the temperature for fairly large regions. A much more careful analysis of the spectra showed there was water ice absorption. But where was it likely to be on the surface? To help show the locations, we can take ratios of images taken through different filters. 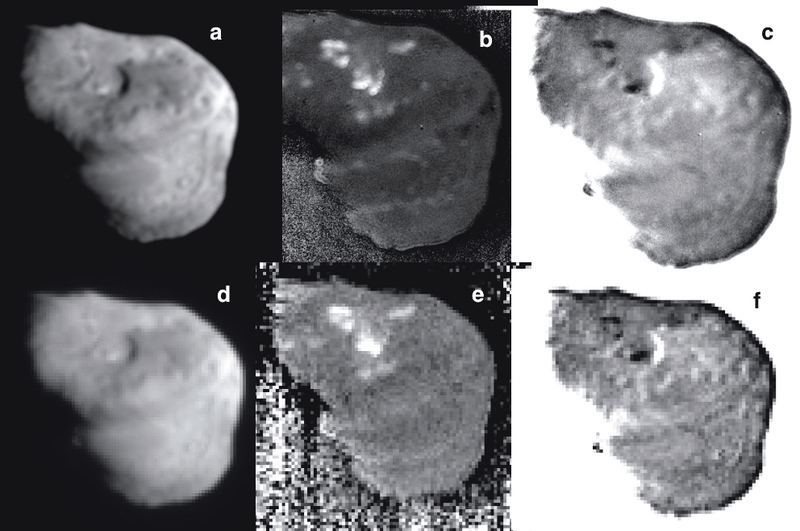 In her article "Exposed Water Ice Deposits on the Surface of Comet Tempel 1," Dr. Jessica Sunshine et al. goes into detail about the detection of these water ice deposits. 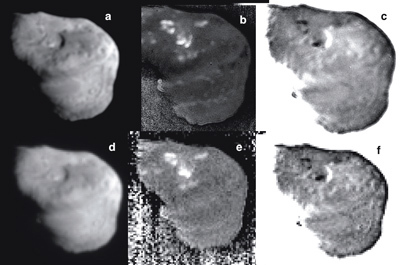 a) HRI 750 nm image (16 m/pixel); b) HRI 450/750 nm ratio image showing areas (brighter), which have relatively higher reflectance at shorter wavelengths; c) HRI 950/750 nm ratio image showing areas (darker), with relatively lower reflectance at longer wavelengths. Similar results are shown for MRI (82 m/pixel): d) 750 nm, e) 387/750 nm, and f) 750/950 nm images. CREDIT: NASA/UM/SAIC J. M. Sunshine et al., Science 311, 1453 (2006); published online 2 February 2006 (10.1126/science.1123632). Reprinted with permission from AAAS. Permission to reproduce.